Yaks were first domesticated in Tibet about 1,000 BC. They are used for their milk, fiber, meat and as a mount or beast of burden. 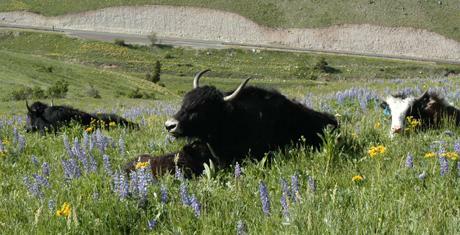 Yaks were introduced into Europe in the 1800s and into Northern America in the early 1900s. Fiber/Wool production – A Yak produces 1- 1 ½ pounds of wool per year (being combed out). You use their fine undercoat, which is comparable to Cashmere. Yak Meat – Yak meat is 95-97% lean and very low in fat and cholesterol. 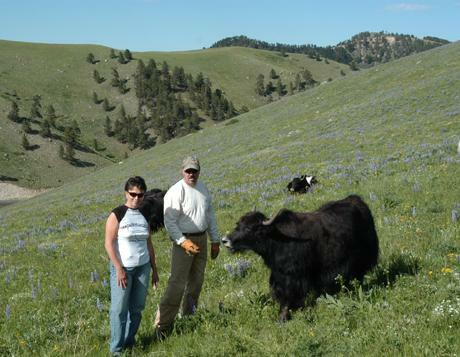 Yak is a high protein meat with less calories than Beef, Bison, Elk or Chicken. Yak meat is a deep red and very tender if cooked properly. Driving and Packing – Tibetans have used Yak as pack animals for thousands of years. They can carry the load of a horse and need no special feed. Their split hoof is easy on trails and can handle mountainous terrain too rough for horses. They will lay quietly at night until morning when they will be ready to pack again. Milk – Yak Milk is a rich creamy color and higher in butter fat (5-7% more content) than cows. In Asia it is usually turned into butter, cheese or yogurt. 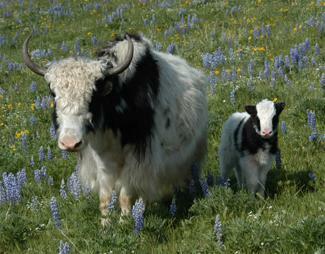 Breeding – Yaks calve easily and can be bred at 18 – 24 months with gestation being 8 ½ months. Bulls can be start breeding at age 3. Yak cows are good mothers and their rich milk allows the calves to grow quickly. Even if calves are born in the winter the cold doesn’t seem to bother them. You can cross Yak with cattle to make a leaner beef.